Poland only sporadically makes the headlines of the Anglo-Saxon world, and its history remains comparatively unknown. It has suffered the dubious distinction of being wiped off the political map in 1795, to be resurrected after the First World War, to suffer seeming annihilation during the Second World War, reduction to satellite status of the Soviet Union after 1945, only to emerge during the 1980s. It is presently a contender for membership in the European Union. The only general introduction to the politics of Polish history in English, The Concise History of Poland covers medieval times to the present. The authors describe how Polish society developed under foreign rule in the 19th century and how it was altered by and responded to 45 years of communism, and developments since its collapse. 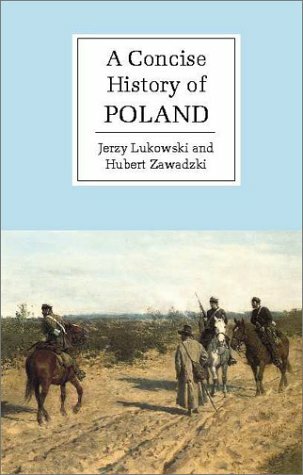 Primarily a political outline of Poland's turbulent and complex past, it traces the process of its rise and fall from the middle ages, from a dynastic realm to a remarkable constitutional experiment in multinational, consensual politics, embracing much of Lithuania, Ukraine, and Belarus. Jerzy Lukowski is Senior Lecturer in Modern History, School of Historical Studies, at the University of Birmingham, UK. He is also the author of, The Partitions of Poland (Addison Wesley, 1998), and Liberty's Folly (Routledge, 1991), and many journal articles. Herbert Zawadzki is Teacher of History at Abingodn School, in Abingdon, UK. He spent the first ten years of his life in various Polish resettlement camps across the length and breadth of Britain, eventually settling near Stratford-on-Avon. He has since traveled extensively in Poland, Belarus, and Lithuania. He has written for several journals and contributed to the Cambridge Encyclopedia of Russia and the former Soviet Union (1994).